Lock in a great price for Golden Park International Foz – rated 8 by recent guests! The staff is very nice and helpful. The pool and the view on the last floor is something to see. Big room, breakfast excellent, good location close to restaurants and bus stops to go everywhere. Staff were lovely and helpful even with my limited Portuguese. Decent breakfast, and good eating options within easy walking distance (try the diner across the road). Powerful shower, room very spacious for a double. Always seemed to have an uber close by, never waited more than 2 minutes. Central location, helpful staff. The bed was really big and comfortable. Standard breakfest, but the cakes there were worth trying. Definately value-for-money type of place. Breakfast was very good, with plenty of fresh fruit, cereals, cakes and protein (eggs, sausages, etc). Dinner buffet was reasonably priced and of good quality. Beds were extra large. 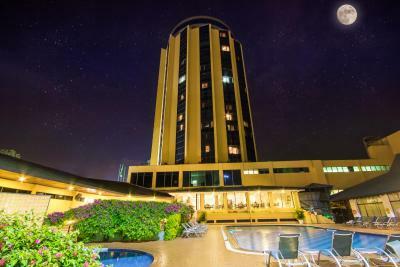 Golden Park International Foz This rating is a reflection of how the property compares to the industry standard when it comes to price, facilities and services available. It's based on a self-evaluation by the property. Use this rating to help choose your stay! One of our top picks in Foz do Iguaçu.Located in the Foz do Iguacu City Center district in Foz do Iguaçu, 8.1 mi from Birds Park, Golden Park International Foz features a restaurant and free WiFi throughout the property. The hotel has an outdoor pool and views of the city, and guests can enjoy a meal at the restaurant or a drink at the bar. Golden Park provides air-conditioned rooms with cable TV and a mini-bar. Bathroom is private and includes a hairdryer. There is a 24-hour front desk at the property. In addition the hotel also offers laundry facilities and a business center. Fresh fruits, breads and cold meats are served on the breakfast buffet every morning. Tea, coffee cold drinks are also available. You can play table tennis and billiards Golden Park International. Iguaçu National Park is 14 mi. The nearest airport is Foz do Iguacu/Cataratas International Airport, 7.5 mi from Golden Park International Foz. When would you like to stay at Golden Park International Foz? Boasting city views, this room features a 32" LCD TV, safe, king size bed, 110v and 220v power sockets and free Wi-Fi. The bathroom includes a hairdryer and amenities. Private parking is available at a location nearby (reservation is not needed) and costs BRL 15 per day. Boasting city views, this room features a 32" LCD TV, safe, 110v and 220v power sockets and free Wi-Fi. The bathroom includes a hairdryer and amenities. With tiled floors, this room features a 32" LCD TV, safe, 110v and 220v power sockets and free Wi-Fi. The bathroom includes a hairdryer and amenities. House Rules Golden Park International Foz takes special requests – add in the next step! Golden Park International Foz accepts these cards and reserves the right to temporarily hold an amount prior to arrival. Nothing of any consequence comes to mind. Windows were looking like no one cleaned them for a year. Mirror in the bathroom was stained as well. Only one guy from the whole staff was able to speak english. Windows couldn't fully open to enjoy the great night view. But other than that everything else was great. Spacious rooms and large beds. restaurant is basic and food was simplest . Rude reception staff and manager. I asked to change room from double bed to twin bed but the hotel manager didn't look to my face and immediately said I booked double room. I need to show my booking confirmation so that they change room. Very bad manner. Room is big. Breakfast if ok.
Maybe towels of better quality. The Hotel is very old. The amenities didn’t work properly. The room wasn’t clean. We complained a few times about cleaning and the staff just changed the towels. The floor was disgusting and also no toilet paper were provided. I have to request a few times extra roll. Air conditioner smells and the remote control didn’t work. I had to request a remote control because the room didn’t have any. We spend one night freezing because we couldn’t switch off air conditioner. I found in the drawer paper and rubbish. The toilets located close to the restaurant were old and the toilet seats were damage. The pictures at booking.com are not update. When you arrive you have a different view of the hotel. Quite ok in the end but I guess some window cleaning and some English tv channels would give an advantage. Control for lights in the room are unconfortable, as they are in a digital plate "hidden" beside the bed. Also, they are only on one side of the bed. Facilities in the bathroom seem a bit old, apparently the shower was leaking on the floor. The staff was very friendly and helpful. The breakfast is good, and has some sweet as well as continental options. The hotel has a pool and a spa, but I did not use them. The room was big and overall confortable. A good air conditioner was present in the room. Fridge very noisy Controller for heating/conditioning was quite weird, essentially an old, partially-working panel close to the bed.